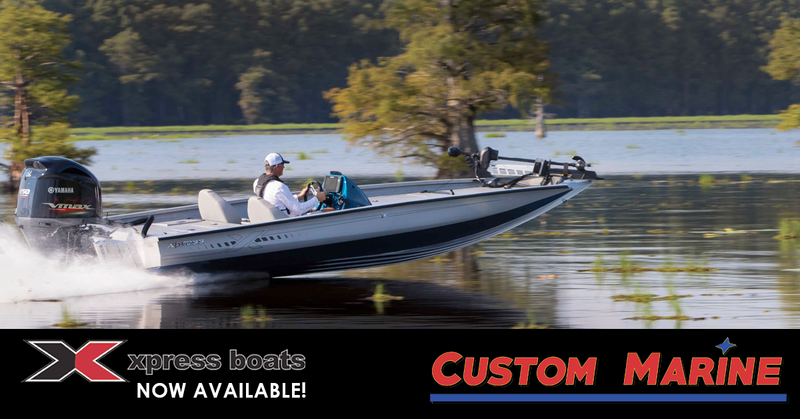 As one of the largest boat dealers in the South East, Custom Marine is proud announce the addition of Xpress boats to our inventory. Xpress boats was founded on a commitment to manufacture the finest all-welded aluminum boat. Three generations later, the Xpress boats family commitment remains the same and has not and will not deviate from that premise. At Custom Marine, we are committed to serving our customers by providing excellent customer service and updating our inventory as demand changes, and we have been since 1971. We are excited to expand our current inventory by partnering with a boat manufacturer committed to producing high quality boats such as Xpress Boats. Initially, we will carry the bass, bay crappy, hunting and jon boats. The boats are expected to begin arriving in late November. As the original all-welded aluminum boat company, Xpress boats builds xcitement into every boat they manufacture. Give us a call, or stop by and see us to be one of the first to be part of the xcitement!